It’s been an eventful week for Kyle Busch. After making his return to the seat of the No. 18 car on Saturday, he and his wife, Samantha, were blessed with a beautiful baby boy, Brexton Locke Busch, two days later. 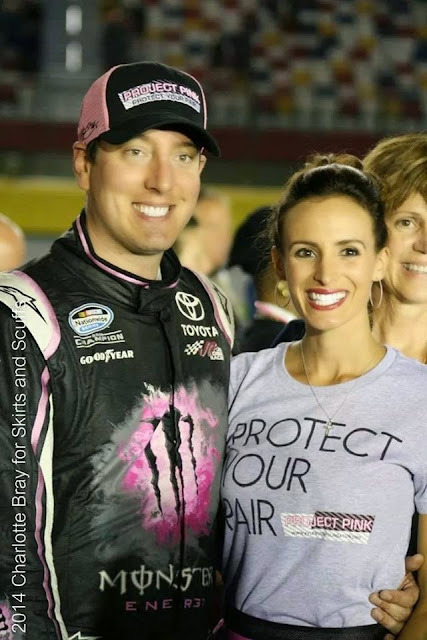 In a teleconference announcing his comeback for the All-Star Race, Kyle voiced his gratefulness for Samantha’s presence in their daily life and especially for her support during his three-month long rehabilitation from broken bones sustained at Daytona during the Xfinity Series opener. “Everything she's done through this process for me and being able to help me, she was there at every beck and call. I can't thank her enough,” Kyle said. Do you have anyone in your life who is always there for you, no matter what? Those who have a “rock,” in the form of a spouse, family member or friend are blessed indeed. But some of us don’t have a person like that in our lives, and it’s disheartening. If seeing endearing posts like Kyle and Samantha’s stirs feelings of longing for someone you can count on, don’t despair. God can be your Rock. In fact, even if we never find another human being to be a soulmate or helper, God is a tower of strength we can run to for support. Our Abba – another name for God that means Papa – loves us with such compassion and fervor, it can fill every nook and cranny in our souls. If you need someone in your life, God longs to be that safe haven and stability for you. When the Bible refers to God or Jesus as a “rock,” it doesn’t refer to some ordinary pebble lying in a field. God is more like an enormous boulder of a magnitude we can’t even imagine. At least ten Bible verses refer to Jesus as a “cornerstone” – a type of rock that anchors a building – because He’s the foundation of our faith. That means we can count on Him. A regular rock made of minerals may shift its position in the earth. Or it might gradually erode over time as water trickles over it. But God is an immovable, indestructible Rock. He never changes or loses even one molecule of Himself to any outside force, because nothing and no one can reckon with Him. Isn’t it cool we have a steadfast God like that who cares for us? The first lines of an old hymn describe Jesus as our Redeemer and our refuge: “Rock of Ages, cleft for me, let me hide myself in thee.” The lyrics mean Jesus was broken for us on the cross to rescue us from our sin. As a result, we can depend on Him because He’s our Rock, our Savior. Will you allow God to be your Rock? Let His life-giving love seep into your thirsty soul, like water soaks into dry soil. Go ahead, lean back into God’s rock-solid arms today.